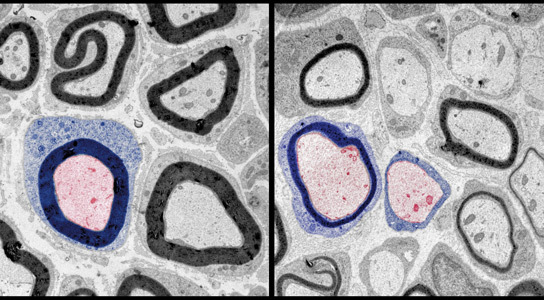 Section through nerve fibers within the sciatic nerve as seen under the electron microscope: the axons (nerve cell projections, pink) are only poorly surrounded by a myelin sheath (generated by Schwann cells, coloured blue) following inactivation of the gene encoding BACE1, which controls the myelination process (right panel). The nerve fibres in a control animal (left panel, BACE1 gene is intact) are in contrast surrounded by thick myelin sheaths (dark rings). (Picture: Dr. Alistair Garratt/Copyright: MDC). Brain connectivity can predict reading skills, thanks to brain scans and the examination of the growth of long-range connections in the brain. These allow researchers to predict how a child’s reading skills will develop. The scientists published their findings in the Proceedings of the National Academy of Sciences. Literacy requires the integration of brain activity in the areas associated with vision, hearing and language, which are distributed throughout the brain. Efficient communication between them is essential for children to become proficient readers. 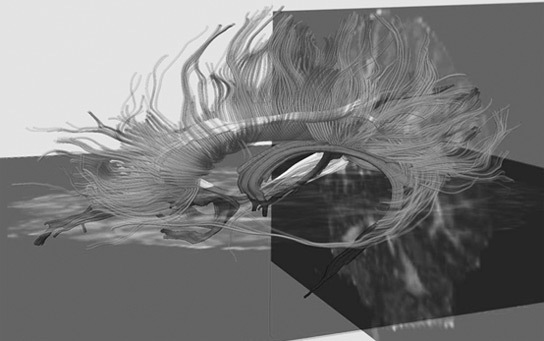 Some of the major white matter bundles identified through diffusion tensor imaging (DTI) tractography. DTI detects the diffusion of water along nerve fibers to map out the communication highways between brain regions. Jason Yeatman, a neuroscientist at Stanford University in California, et al. studied how the development of reading ability relates to the growth in the brain’s white-matter tracts, the bundles of fibers that connect distant regions of the brain. The scientists tested how the reading skills of 55 children between the ages of 7 and 12 developed over a three-year period. There were big differences in the children’s reading ability, and these differences persisted throughout the term of the study with weak readers remaining weaker than others at the end of three years. The differences in the growth of both tracts could predict the variation in the children’s reading ability. Strong readers started off with a weak signal in both tracts on the left side of the brain, which eventually got stronger over three years. Weaker readers exhibited the opposite pattern and the signal got weaker over the three year period. The growth of these white-matter tracts is governed by pruning, the process by which extraneous nerve fibers and neuronal connections are eliminated, and by myelination, individual nerve fibers in the tracts are enveloped by fatty, insulating tissues that increases the speed of transmission. Both processes are influenced by experience and occur at different rates and times in different people. The relative timing of pruning and myelination differs between strong and weak readers, states Yeatman. In good readers, both processes are unfolding together at an even rate. In poor readers, the two processes are out of sync. The findings could help researchers understand the relationship between the strength of connections and reading skill. If they are able to determine exactly when pruning takes place, children might find it easier to read at this stage of the development, when there is greater potential for remodeling in the brain. Be the first to comment on "Growth in Brain’s White Matter Tracts Could Predict Literacy"